December | 2013 | I'm Skinny, Now What? 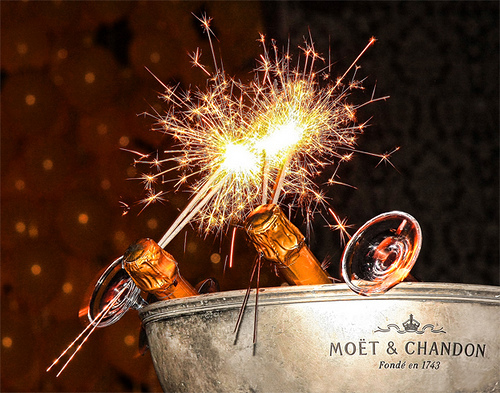 The new year is only two days away, and we all know what happens at midnight: champagne, kisses and promises likely to be broken. I’m not a huge fan of New Year’s resolutions. It’s just a vow to do something that you should have been doing in the first place. I stopped making them a long time ago. The few resolutions I’ve made in years past haven’t stuck (like to stop swearing, dammit). Everyone has a list of goals that they want to achieve, and the new year brings about a fresh start. I get it. What better time than at midnight on the first day of new year than to wipe the slate clean? The problem I have is with a certain sect of revelers who need a new beginning. I’m talking about the resolution fitness crowd. As a person who is supposed to support those going through their fitness journeys, I recognize my own hypocrisy in saying how much I dread the resolution crowd. They can be just…the worst. Maybe it’s because every day until January 1, many washed down their slices of cake with bottles of beer. Maybe it’s because the first week of the new year offers all kinds of neat gym promotions. Or maybe it’s because they vowed to get out of the house more and why not let the gym be the new meeting ground. If you’re part of the resolution crowd, let me first say congratulations! You’ve taken the first step toward achieving a goal you’ve set out for yourself. However, don’t become the person we gym rats love to hate. Gym rats cannot stand the first few weeks of the year. Many in the resolution crowd have gotten gym memberships in their stockings. Many of them haven’t set foot in a gym since this thing was popular. We’re all working toward the same goal, but there has got to be a way for the rookies and the pros to co-exist. I mean, they do it in the NBA every year, right? The Machine Newbie: This person hasn’t set foot in any type of gym since high school and definitely hasn’t taken two steps on a treadmill before. You will often see him poking at the buttons and wondering why it hasn’t started yet. Instead of giving your go-to exasperated sigh, help him out by hitting Quick Start and reminding him that there’s a 30-minute time limit for machines. The Fashion Star: This person hasn’t been to the gym since she got right for her trip to Ibiza. The joys of fall food and Christmas cookies have taken their toll, but the real impetus to get back at it is the new workout gear hubby bought her for Christmas. She’s really there to catch up with the trainers and let them ooh and ahh about her new sports bra before hitting the shower. You’re not going to see her until her next beach trip, so you can just bypass her until you need a new vacation buddy. The Training Groups: Gyms have this little habit of offering discounts for group sessions. That’s fab; I’m all about saving a buck. The problem starts when four or five friends—after three bottles each of New Year’s bubbly—decide it’s time to get back in shape. Never hold people to the promises they made while drunk. The person who thought of this grand idea will only show up to the first class. Two more will drop out and soon there’s there’s just one lonely person left. To my vets, I say go make friends with that person. They’re really trying to help themselves and could use a little extra encouragement. And maybe you can get in on that group discount. Resolutions can be a good way to keep yourself in check. It’s always good give yourself an annual review (your job does it). For that reason, I can’t hate the resolution crowd too much. Just don’t hog my machine! Anyway, what are some of the promises you’d like to keep to yourself? And Happy New Year! Process black beans, cheese and salt in a food processor or blender until almost smooth, adding enough broth to make desired dipping consistency. 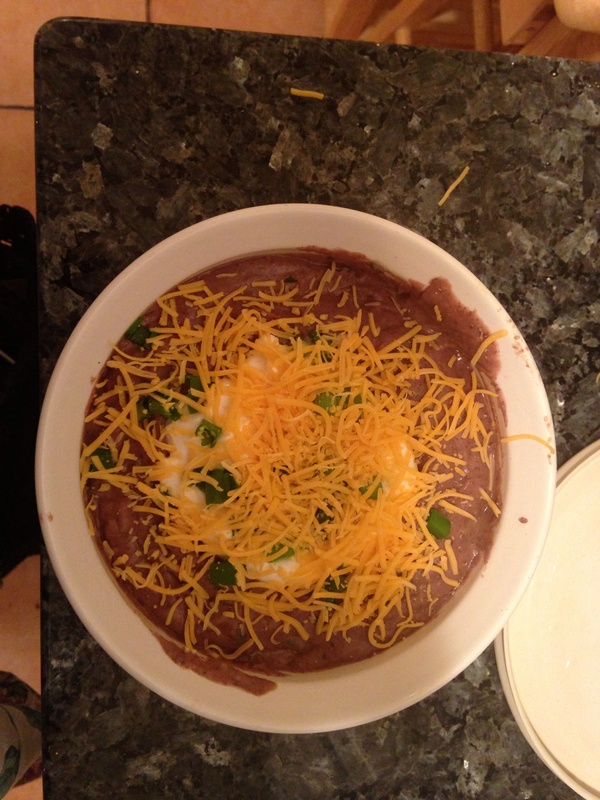 On game day, nothing beats a good bean dip, this one proved that. It was very flavorful, but not very appealing to the eye. I added a dollop of non-fat sour cream, sliced green onions and sprinkled about a tablespoon of shredded cheese on top to make it prettier. It didn’t add many more calories, but who’s really counting when you’re digging in the dip? Jay and Bey have gone vegan for 22 days, and their challenge ends on Christmas Day. Sure, they can celebrate Christ’s birth with a rack of lamb and shout “Joy to the World,” but what did this challenge really entail? Jay decided to take up the challenge before his 44th birthday with the encouragement of a friend (read: Gwyneth) who wanted him to only have plant-based breakfast. With the serendipity of the numbers falling into place along with the bonus of a Christmas ham likely waiting for him at the end of this, Jay decided to put down steak knife and pick up the almond milk. According to Marco Borges’ 22 Days Nutrition site, which has been partnering with the Carters on this journey, the benefits to plant-based living include preventing cancer, lowering cholesterol levels, and preventing and even reversing diabetes. Between touring and releasing secret “visual albums, Mrs. Carter has been updating her Instagram account with vegan options, some of which look kind of tasty. But I don’t know if I could go full-on vegan. I have friends who are vegetarians and pescatarians. Most of the recipes I post on this site are vegetarian. However, sometimes a girl’s got a taste for a Five Guys burger. While I’ve never gone vegan—or vegetarian for that matter—I know what it means to give up a food you once enjoyed. I haven’t eaten pork for more than 15 years. It was difficult in the beginning because in my mind, nothing could top a good ham and cheese sandwich. I never stopped cold, but eventually it became passing on the pork chops, then the bacon, and soon enough it was bye-bye ham. 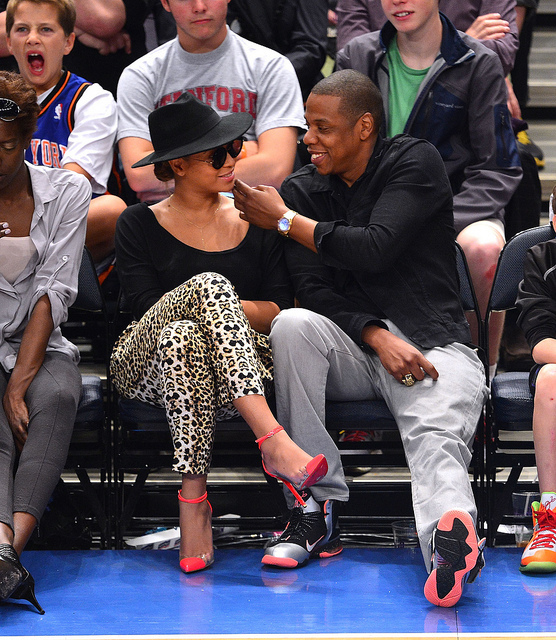 I applaud Bey and Jay (as if they need my approval) for taking this on. It is hard to give up the things you once enjoyed in order to better yourself. Living is challenging enough without creating hurdles for yourself. The Carters gave themselves less than a month to decide if this was something they could stick with. I understand that wholeheartedly. That’s how the weight-loss journey began for me: I’ll give it a shot for a little while and see if I like it. I challenge you to do the same. Find something that makes you step outside your comfort zone. What is it that scares you a little? It doesn’t have to be anything big, or anything health related, for that matter. Maybe you’ve never gone to dinner alone. Maybe you’ve never tried that crazy-looking contraption at the gym. Or just maybe you’ve been wanting to spark up a conversation with the cutie across the way. The point of a challenge is to test your limits and see what you are capable of. What do you think you can do? Cover beans with 2 inches of water in large saucepan; heat to boiling and boil 2 minutes. Remove from heat and let stand 1 hour; drain and return to saucepan. Add two cups broth to beans and heat to boiling; simmer, covered, 30 minutes. Add vegetables and herbs; simmer covered, until beans are tender, 30-45 minutes, adding more broth if necessary (beans should be moist but without excess liquid). Discard bay leaves. Stir in red pepper sauce, cayenne pepper and liquid smoke; season to taste with salt. 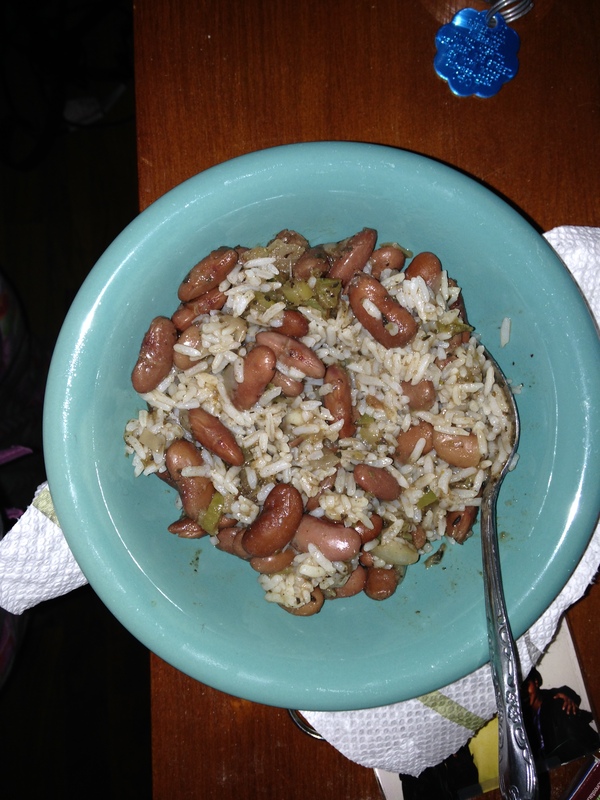 I’ve always made my red beans and rice the quick way: from the directions on a side of a can of Goya beans. I have to say that this way, while a little more complicated and with a longer cook time, is so much better. The flavors are so full. I used a bullion cube to make my broth, but I made it while the beans were soaking, so as not to add to my cook time. Also, while the beans are soaking, you can make other things. There’s no sense in watching beans soak when you could be adding to your meal. I never wanted to cook with dried beans before because it just takes so long, but I understand why now. Good things take time. I highly recommend this one, especially in these frigid temps. You will not defeat me! I haven’t been able to pinpoint when the problem began, but I know it’s happened. I set a limit for myself: I’d never go past 150 again. Then I hit 151. That’s no problem, I thought. I can lose that easily. Excuse after excuse and here I am pushing 160 and about to go for a run. I know what has to be done; it’s just hard to stay on track. I’m not a fitness buff nor am I a health nut (as evidenced by my love of goldfish crackers). 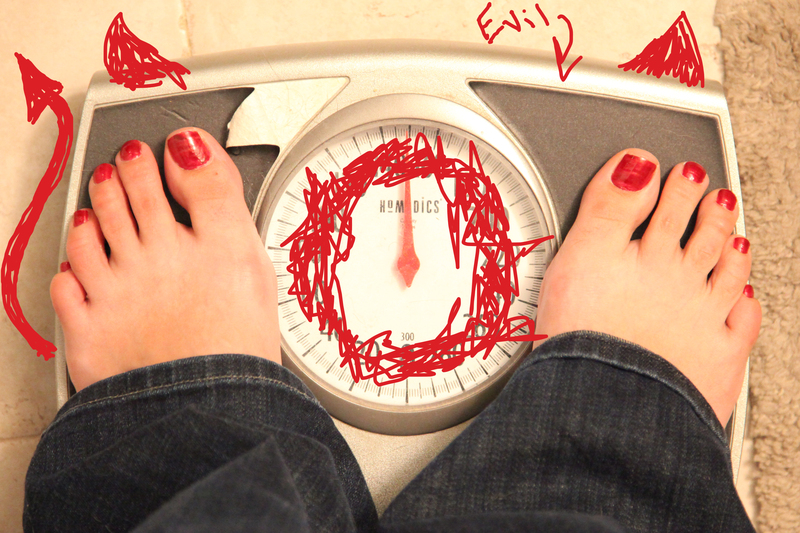 I don’t believe in being a slave to the number on the scale, either. But I like to look a certain way, and there’s a general weight range that I’m veering away from far too easily. Here’s the thing: we’re all works in progress. Before, during and after the weight-loss journey is over, you will have to repeat the process. You know why? Everybody backslides. Everybody. Look at Oprah. No one is a a better example of the truth about yo-yo dieting. It’s not a bad thing, it’s just reality. People gain and lose weight depending on everything from their moods to the moon. It’s nothing to be ashamed of. At my peak of weight loss, I lost over 60 pounds. But then began the process of lose, gain, repeat. I’m not alone in this. Many, many moons ago, a woman from Tennessee trotted out on a TV stage with a wagon of fat. Remember this? I don’t do this to poke fun at the Mighty O, who even says in the video that she was starving herself at the time and has since come forward that her weight gain is the result of thyroid problems. I do this to say that no one is perfect. You will mess up. Just don’t let that be a deterrent to continuing on your way to your goals. 1. Switch up your routine. Any physical trainer will tell you not to do the same routine over and over again. You don’t think to blink, walk or even flex your fingers. It’s a learned activity that the body does without much provocation. The way your body has learned these activities is similar to the way it will learn the same Zumba video you’ve been doing every day for three months. After the first month, the pounds wont drop anymore because your body knows what to do. You have to shock the system. So instead of Zumba, go swimming. Instead of running, do some resistance. Don’t let your body settle into one routine. 2. Don’t beat yourself up about it. This is just a thing that happens. You’ve done the work before, so you know what to do now. You are one of millions of people in the world who have probably fallen back into old habits. Just remember why you started in the first place and let that be the motivation to get you going again. 3. Remember your body is always changing. Maybe some of those pounds are just life catching up with you. Don’t let the number on the scale rule your life. It is solely there as a guide only. It’s about how you feel in your skin, and you have to adjust to life’s little changes…like Oprah. What do you do when you feel you’re getting off track?